These Easter egg ideas require NO dye! 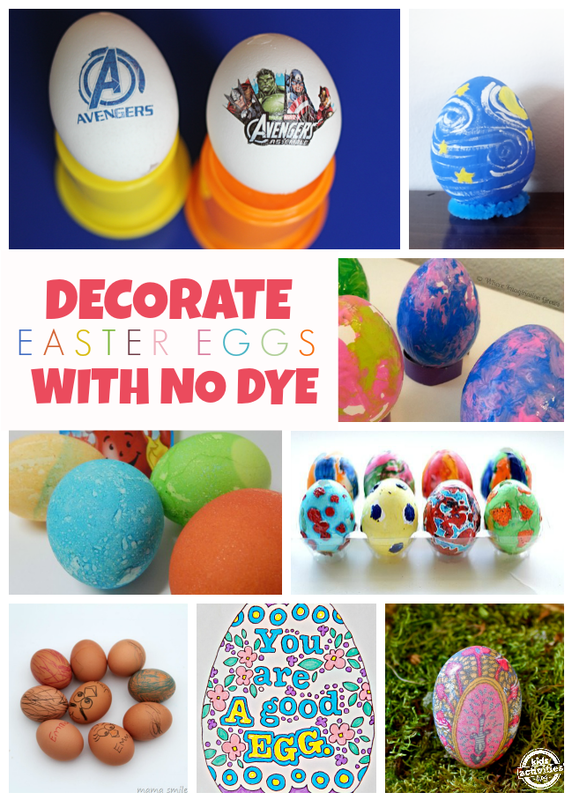 These are all creative and fun ways to decorate those Easter eggs without mixing tablets in vinegar. We found these and so much more fun over on our Facebook page and our activity link-ups. Head over and share yours, too! 1. Temporary Tattoos – Find temporary tattoos of your kids favorite characters and place them on blow out eggs! 2. Melted crayons – This idea from Five Little Chefs is a way to get those eggs colored fast and creatively. 3. Simple scribbles – Keep it simple by simply handing them crayons and let them draw and scribble however they’d like. From Mama Smiles. 4. Marbelized – These painted eggs from Where Imagination Grows create a cool marble effect on plastic eggs. 5. Crayon Paint – Create your own egg paint by melting crayons. From Art Activities for Kids. 6. Kool-Aid – This uses the same concept as the usual egg dye but replaces it with Kool-Aid! Just add Kool-Aid mix and water for the eggs to soak in. From Totally The Bomb. 7. Silk Dyed – Use silk fabric pieces to create some really beautiful designs. From Twig and Toadstool. 8. Paper Mache – Create Easter eggs inspired by historical art like Starry Night. From Inspiration Laboratories. 9. Shaving cream – Make a cool tie dye effect like A Thrifty Mom by mixing a few drops of food coloring with shaving cream! 10. Sharpie tie dye – Use a Sharpie marker to draw and add water droplets to swirl them into a fun tie dye pattern. From Housing A Forest. 11. Image transfer – Follow these instructions from The Artful Parent to put your favorite images right onto an egg. 12. Nail polish – I bet you never thought of using nail polish before, right? This creates a really cool swirl effect. From Henry Happened. 13. Aluminum Foil – Danya Banya shows us how decorate plastic eggs with painted aluminum foil. 14. Coloring Page – If you aren’t in the mood for decorating real eggs, just keep it simple by coloring these free egg printables.